The swift flight to Hydrocryst and transversing Rainbow Falls had become more routine with each successive trip. Most of the new discoveries would now be concentrated on the interior structure of the moon. Abe activated the scanners after passing through the falls. He and Babe had caged the birds for the flight down, and Abe deposited them on a grassy knoll along the beach's edge to allow them to acclimate themselves to the higher oxygen content of the internal atmosphere. He reboarded the craft deciding to rapidly sweep to the left, parallel to the falls for 100 miles, then inland 10 miles and back parallel to the right, crossing their point of origin perpendicular. They would then continue another 100 miles, and turn back toward the falls, angling right back to the birds. The shuttle would record the terrain at a speed of 400 miles/per/hour while set on autopilot, and would accomplish the complete circuit in slightly over an hour. Abe and Babe could then review the topographical data scans at their leisure and decide on the best site suitable for their mutual future needs. Abe computed the selected course and programmed the navigational computer as Babe locked the scanners into record mode. They securely strapped themselves into the padded command seats before initiating the starting sequence. The pair would be subjected to physically serious gravitational forces during the quartet of 400 MPH hairpin turns! All systems read green, and Abe impressed upon Babe's mind to brace for the extreme acceleration of take-off. The main drive roared to life at his command, pinning them to their seats until the shuttle attained top speed. The couple monitored the precisely detailed contour map rapidly being generated by the computer. The strange terrain showed to be frequented by huge crystalline structure outcroppings of unknown compositions. The scanners were incapable of deciphering specific minerals at the high rate of speed. Halfway through the first leg of the sequence, two rivers were mapped running parallel to one another. One body of water flowed inward, but its counterpart flowed in the opposite direction! The data seemed impossible to the couple, but Abe confirmed its validity by crossreferencing other inputs. Even more amazing was the fact that the outflow consisted only of pure, fresh water while the interior flowing liquid was a saline solution probably like that on the outside! On-site collection of samples would be necessary to scientifically evaluate the strange phenomenon. The explorers mentally noted the abundance of pure water and marked a spot on the river for consideration of the base campsite. A profusion of stately, large trees also grew along the fresh-water river. Abe's acumen predicted a close repetition of the book of data on the inward pass from the reverse direction. He was confirmed a short time later. Nothing outstanding printed on the map for the remainder of the voyage, except more various types of vegetation and crystal outcroppings. They had hoped to find at least one more source of fresh water. As the shuttle started decelerating to end the programmed flight sequence, the pair knew the base would have to be established near the fresh-water river. Abe reprogrammed the craft to fly them between the twin rivers after collecting the eagles and doves. He and Babe agreed to scout from that point on foot to select the campsite. Babe expressed a request to explore the saline river first, suggesting the venture might offer clues to the internal workings of Hydrocryst. The pair left the shuttle's hatches open for the birds' sake and started hiking along the crusty white banks, cautiously acknowledging the blatant absence of green plant life. After several estimated miles of brisk walking, the river abruptly vanished into a crevice between two enormous crystallized salt domes. Simply glancing at one another, Abe and Babe silently commenced climbing out their insatiable scientific curiosity and the quest for knowledge of their new homeland. They had simultaneously detected a strange gurgling vibration which was evidently originating from the far side of the structure. Upon reaching the rounded summit, they stood amazed, watching the entire river descend into a large, oval-shaped sinkhole, apparently leading directly to the center of the moon! While the couple rested their physical bodies, they recorded the new data in their photographic memories. Abe speculated that waste products carried in the backflow of saltwater probably helped fuel Hydrocryst's internal furnace. Babe added the possibility that the water and wastes were oxidized in a contained, hydrogen reaction, . . something similar to Earth's sun dynamics. That would account for the constant ambient temperature. If their calculations proved correct, the relative temperature should slighly increase with every few miles traversed toward the core. Satisfied with the theory, the pair made their way to the base of the domes and directly overland to the fresh-water river. The plush vegetation surrounding the clear waters before them seemed healthy beyond imagination. Untold varieties thrived proudly in direct contradiction to the desolate, barren banks across the way. Plant life was sparse even near the saltwater. The trees and other vegetation had steadily increased in size and foliage during the trek to their present location. An astonishing assortment of berries and fruit-bearing trees tempted the young explorers. They all would have to be analyzed to determine which, if any, might be edible. The the food stores on the New Hope would have to suffice until the analysis could be completed. Overjoyed, Abe and Babe instinctively knew they had discovered the perfect base site after scaling the back side of a small hill dotted with multi-colored flowering shrubs. It sheltered a breathtaking, clear lagoon, naturally separated from the main river. A small tributary stream gently plunged over a ten foot rose quartz formation into the shimmering pool below. A quaint, white gypsum beach extended behind and around the miniature waterfall, dividing the lush green flora from the slick water. Babe expressed to her mate the irony of finding such a beautiful spot to fit their basic needs purely by accident. It would provide plenty of fresh water for drinking as well as a natural shower or bath, . . aside from its serene, aesthetic values. Abe's mental prowess picked up his mate's subtle thoughts indicating the intense romanticism their choice of site had sparked within her feminine emotions. The private haven harbored a sensual effect all its own. Unfortunately, the pair must hike back to retrieve the shuttle. Abe's intellect sensed that Babe would much rather stay and wait for his return. She was thoroughly intrigued by the unspoiled scenery surrounding her. Feeling no eminent danger from any direction, Abe allowed his mate the pleasure of the extended stay. Her peace of mind was very important to his own well-being. Besides, she would need to pilot the shuttle back to the New Hope for another load while he started laying out the camp set-up. Abe kissed her and briskly strode off in the direction of the shuttle. When safely out of her telepathic range, he decided to arrange her a pleasant surprise, . . The lonesome birds greeted Abe excitedly when he finally reached the ship. He removed a small section of the computer map containing their base-camp selection. On the piece of map, he expertly plotted the exact location of the sandy white beach behind the small waterfall. Mischievously, he scribed an "X" on it and wrote, "I Love You, and this would be an excellent place to prove it!" Grinning to himself, he rolled the scrap up tightly and gently tied it on one leg of Babe's male dove. Abe released his great eagles first, knowing instinctively they would survey the immediate vacinity while stretching their mighty wings. 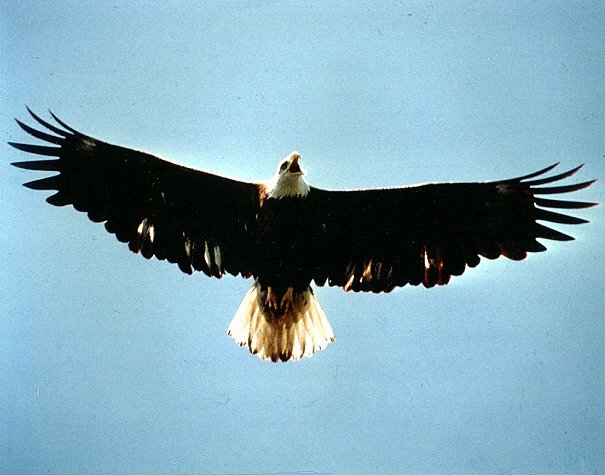 The majestic eagles took off in joyful flight, circling ever higher until almost brushing the crystal canopy. Abe sensed his friends did not quite understand why there existed a barrier in this new sky, but he knew they were enjoying the sheer pleasure of flying free. They wasted no time in their instinctive adjustment of the strange environment. Abe vowed to never cage them again, deeply sensing their fond appreciation to him for their unhindered freedom. He had developed a great feeling of love and respect for these predators of the sky. He could tell the bond was mutual from the birds' standpoint as well. Abe experienced an exhilarating, peaceful glory while watching the masters of the sky perform their graceful aerial acrobatics. Realizing that Babe would be worried about his delayed return, he whistled loudly, and his friends obediently banked sharply and coasted down to his leather-clad shoulders. Their keen instincts informed them that Abe had an important task for them to perform in his behalf. He perched them on a small tree and removed the doves' cage from the shuttle. Abe knew the strong bond his mate shared with the fragile doves and felt secure that they would have no trouble in locating her at the basesite. His eagles now understood that he simply wished them to follow the little doves to insure their safety, and that he would be along shortly. The alert eagles waited patiently as their master gently released the doves. They immediately soared upward, also appreciative of their freedom. Circling only once to stretch their wings and gather their bearings, they paused briefly, then flew straight away in Babe's direction! Abe grinned broadly, knowing his cherished mate would be ecstatic with an air arrival of her beloved doves and secretly wished he could read her thoughts when she discovered the attached note. He was yet to realize just how much he and his mate thought alike, even when they were apart, because he had no idea that she was still ahead of him on the surprise note-writing. Satisfied that the doves had time enough to reach their destination, and Babe to enjoy a few moments of personal reflection, Abe clapped his hands sharply and pointed in the direction of the doves. His eagles immediately rose into the air in leisure pursuit. Abe felt an intense desire just to see her. He hastily plotted the coordinates into the flight control and set it for maximum speed. He initiated the start as soon as the sequence registered. The efficient craft roared to life once again. Almost no time had elapsed before the small ship commenced braking. The entire trip had lasted a scant 58 seconds!